What do You Mean I Can’t Come? We know that back to school time can often be a nerve-wracking time for parents and children. But what about your dog? It’s likely there has been more activity around the house over the summer. Perhaps your dog has spent much more time than usual with you and your family and friends, or has enjoyed longer, more frequent walks. Reminiscing about a summer well spent isn’t solely for humans, dogs also feel it when after a fun time, everyone goes their separate ways again. 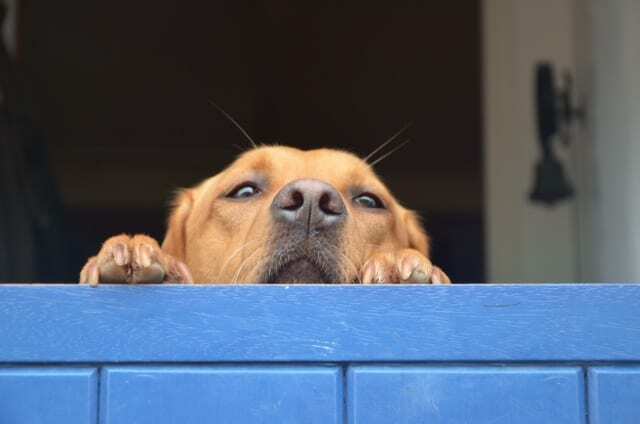 They can find themselves kicking their paws alone at home, waiting for everyone to come home and this is sometimes when separation anxiety in dogs can occur. There are ways to minimise the anxiety you could both experience by following a few steps to reassure each other that it won’t be long before you’re reunited and all will be fine! As a general rule when with your dog, ignore attention seeking behaviour such as pawing, barking, licking, nudging or leaning on you unless you initiate it. This will help reduce over attachment. If your dog is allowed to play interactive games with you, such as tugging and retrieving, hyperactivity will be reduced and calmness increased. Allocate a few minutes of your morning routine to spend time interacting with your dog so they remain mentally and physically satiated until your return. It’s important that your dog happily accepts time on their own even when you’re at home. Don’t allow them to follow you from room to room so they are totally dependent on you and then suddenly isolated when you go away. The contrast will prove to make being without each other, even for short amounts of time, more difficult on you both. Ensure your dog gets a small part of his daily diet in an activity ball or other feed puzzle. Stuffing a Kong with something delectable and freezing it can also be a rewarding pacifier to give your dog in your absence. These types of tools can provide hours of entertainment; leaving little time to miss you as they get stuck in to getting out every…last…little…bit! For young puppies who have been used to being close to their mother since birth and are now in a new home with you, the contrast can be acute. Leave a worn, unwashed piece of clothing of yours, placed on the other side of the door where your puppy will be sleeping; giving the impression to them that you’re not far away. Try to be matter of fact when you leave. Making a big fuss when you go will only make your dog want to be with you at the moment you need them to accept you’re leaving. We know, we know, those big, sad eyes make it SO hard to ignore one last cuddle, but for his sake try to resist! As hard as it is to resist scooping up that little or big ball of fur or giving them a massive bear hug, try your hardest to resist greeting or looking at your dog the moment you arrive back, until he is completely calm. Whilst this takes a lot of willpower on your behalf, it prevents highlighting the loneliness of your absence. Making the next day at work or school, easier to face – for them and for you. No owner likes to think their dog could be sitting feeling miserable at home whilst they are off having fun. By following these simple steps that you can make the time you’re away enjoyable and stress-free for your dog, and in turn you can relax and enjoy yourself too.